Bassya (Maltzer) Bibel (1908-1980) was born in Kopaygorod, Podolia – a territory that was known as Bessarabia at the time, and is now part of Ukraine. As Jews, the community suffered violence and discrimination from the Russian government and Cossacks. At the age of 12, a year after her father’s death from typhus, she and her mother and younger brother fled, heading to the United States, sponsored by relatives who had come earlier and settled in San Francisco. Her younger brother succumbed to measles and died on the ship. 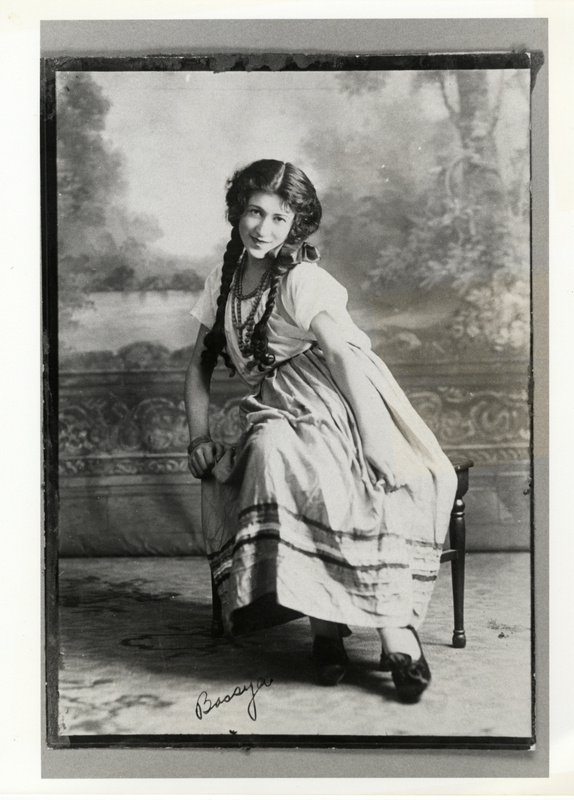 As a teenager, she became active in the San Francisco Yiddish Literary Dramatic Group, including several starring roles. After graduating from high school she attended Heald Business College and became engaged to a distant cousin, Sol Friedman, who was also a member of the drama group. They were married when she was eighteen. While pregnant with her first child, she realized that she was in love with another man in the drama group, Philip Bibel. When her baby was two, she decided to divorce and begin her life with Philip. They went on to have two children together, and shared their lives until her death in 1980. Bassya was described by many who knew her as a “gypsy,” “bohemian” and “diva.” She had a deep love for family, but also had a life-long passion for the arts and an enduring concern for issues of human rights and social justice. In her later years she published four books of her poetry. These books, along with oral interviews, scrapbooks and letters are included at the Magnus Collection of Jewish Art and Life in Berkeley, CA. Wonder I had so many tears to cry. I saw him with bent head weep.